Reebok has just released the classic GL6000 running shoe, for both men and women, to YourReebok. This re-released design, featuring an iconic silhouette, TPU heelclip and non-marking outsole is now customizable so that you can put your signature on a Reebok classic. 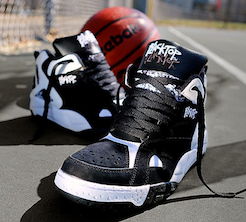 One of the most popular shoe collections ever introduced by Reebok, the Blacktop collection, has now been re-released and is ready to hit asphalt courts everywhere. First introduced in the early 90’s, these basketball shoes are designed especially for the mixed terrain found on city courts. To help ballers navigate the terrain and stay balanced, the Blacktop line puts an emphasis on stability, lateral support, with a higher cut, thicker leathers and near-indestructible materials. This summer, if you’re going to bring your game to the playground, you had better bring your Blacktops too.